Journal of the House of Lords: Volume 4, 1629-42. Originally published by His Majesty's Stationery Office, London, 1767-1830. DIE Lunæ, videlicet, 24 die Januarii. Information concerning Ld. Digby's Business. Letter concerning the Rebellion in Munister. The King to be moved for the Royal Assent to it. Message from the H. C. for Oneale to be examined and be a close Prisoners. And to adjourn the Bishops Trial. Witnesses to be examined upon Interrogatories in the Case of the Twelve Bishops. Committee to examine the Witnesses. Message from the H. C. for the Lords to concur in the following Propositions of the Scots about Ireland. The Scots Propositions concerning 2500 Scots. Pay from the 8th of December. His Majesty's Answer to the Petition of both Houses, concerning L. Kymbolton, &c.
Munition issuing to be supplied. The Queen will send an Answer. Message to the H. C. with the King's Answer. Report from the Committee at Grocers Hall. Exceptions to L. Craven about Words. L. Digby gone to Sea. Petitions from sundry Counties about the Militia. Monies to be raised in Munster. L. Dungarvan to be Governor of Youghall. Day for the L. Lieutenant and other Officers, to go to Ireland. Abstracts of Letters from Ireland. 2500 Scots to be sent to Ireland. Address of Thanks to His Majesty. Additions proposed by the Commons. Message from the H. C. about some Words spoken by Lord Craven of Mr. Fynes. Lord Craven desires Time till To-morrow, to answer. The Earl of Bristoll signified to this House, "That, whereas Information was given before the Committee at Grocers Hall, that a Servant of Mr. Oneale's should come to his Lordship's House, and receive a Letter with Five Pounds, which Letter was to be conveyed to the Lord Digby; it is since come to his Lordship's Knowledge by Accident (which he thought fit to acquaint their Lordships withall), that the Letter was delivered to Mr. Oneale's Man by Sir Lewis Dyves (who lies in his Lordship's House), to be sent to the Lord Digby, and gave the said Messenger Five Pounds, to bear his Charges." Ordered, That this be communicated to the Committee of the House of Commons at the Rising of the House; and the Earl of Bristoll to make the same Narration there as he did now. Next was read a Letter, written from the Earl of Corke to the Lord Goringe, dated the 12th of January, from Youghall, in Ireland; the Effect of which Letter was: "That most of the Natives in Munster are in Rebellion: That Youghall is the only Town in that Province for the English to retire to, and they have but Two Hundred Men to guard it, which they are forced to pay daily with Money; and, if speedy Supplies of Men, Money, Arms, and Provisions, are not sent from hence, that Province will be wholly lost." Another Letter, from the Earl of Corke, written to the Earl of Warwicke, was read. Ordered, That these Letters be communicated to the House of Commons. Then the Earl of Warwicke reported, "That the Committee at Grocers Hall have met, and considered of the Bill for the Contribution for Ireland; and the Opinion of the Committee is, That it is fit to pass as it is." Hodie 3a vice lecta est Billa, An Act for a speedy Contribution and Loan, towards the Relief of His Majesty's distressed Subjects of the Kingdom of Ireland. And, it being put to the Question, it was Resolved, nemine contradicente, to pass as a Law. Ordered, That the next Lords that go to the King are to move Him to give His Royal Assent to this Bill. "To let their Lordships know, That the Committee of the House of Commons which sat at Grocers Hall received Information, That one Saunders, a Servant of Mr. Oneale, lately passed through the City Watch one Night, under a Counterfeit Name, and stiled himself Mr. Holles's Servant; who, being suspected, was apprehended, and being examined, it appeared that he hath had Conference with Mr. Oneale. Upon this, Mr. Oneale hath been examined; and their Examinations do differ. "The Committee of the House of Commons finding that Mr. Oneale is committed by their Lordships, the House of Commons desire that Mr. Oneale may be examined again by some of the Members of the House of Commons, but not upon Oath; and that he be further restrained as a close Prisoner, that none come to him, and speak with him, but in the Presence of his Keeper, until he be examined. "Also, whereas their Lordships have appointed Tomorrow for the Trial of the Twelve Bishops that are impeached for High Treason by the House of Commons, they desire their Lordships will be pleased that the said Trial may be deferred for some convenient Time; and that, in (fn. 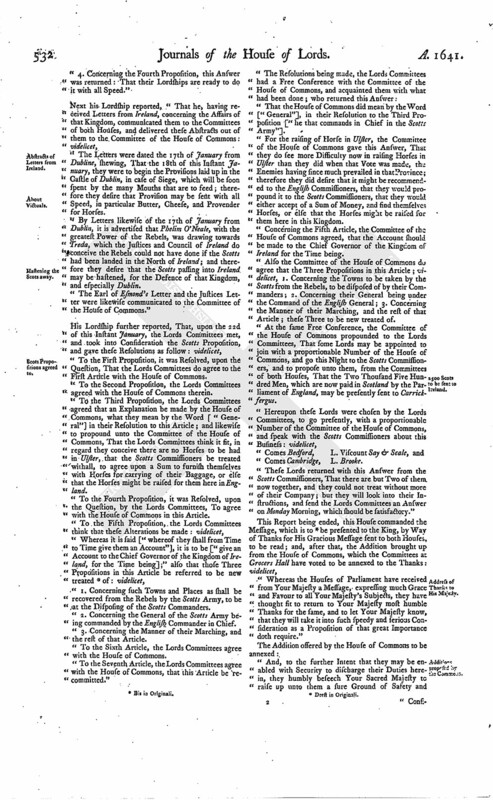 1) the mean Time, some Examinations concerning that Business may be taken before the Trial; and, for this Purpose, he was commanded by the House of Commons to desire that their Lordships would appoint a select Committee, to take the Examinations of such Witnesses as the House of Commons shall produce, in the Presence of some Members of the House of Commons." The House taking this Message into Consideration; it is Ordered, That Mr. Daniel Oneale, now a Prisoner in The Gatehouse, shall be examined by such of the Members of the House of Commons as they shall appoint; and that none shall be permitted to speak or converse with him, but in the Hearing of his Keeper, until he hath been examined by some of the House of Commons: And it is also Ordered, That a Committee of Lords shall have Power from this House, by virtue hereof, to examine such Witnesses upon Interrogatories as shall be produced by the Members of the House of Commons, against the Twelve Bishops lately impeached by them of High Treason; and that the said Bishops may cross examine the Witnesses before the said Lords Committees, if they think good, in the Presence of the Committee of the House of Commons: And lastly it is Ordered, That their Cause now depending in this House shall be peremptorily heard at the Bar, without any further Delay, on Tuesday the First of February next ensuing; and hereof the said Bishops and others herein concerned are to take Notice, and attend the Hearing accordingly. Their Lordships, or any of them, to meet when and where they please; and any of the Members of this House to be present (as at all other Committees), if they please. "1. That Provisions of Victuals be presently sent to Carrickfargus, to be sold to our Soldiers at reasonable Rates, answerable to their Pay. "2. That an Order be set down, how they shall be paid there, and from whom they may require the same. "3. That they have the Command and Keeping of the Town and Castle of Carrickfergus, with Power to them to remain still within the same, or to enlarge their Quarters, and to go abroad in the Country, upon such Occasions as their Officers in their Discretion shall think expedient for the Good of the Kingdom; and, if it shall be thought fit that any Regiments or Troops in that Province shall join with them, that they receive Orders from the Commanders of our Forces. "4. That Provision of Match, Powder, and Bullets, be presently sent to Carrickfergus; and what Arms, Ammunition, or Artillery, shall be sent over with them from Scotland, that the like Quantity be sent from thence to Scotland, whensoever the same shall be demanded. "5. That a Part of the Thirty Thousand Pounds of the Brotherly Assistance be presently advanced to us, which, although in a just Proportion to these Men it will amount but unto Seven Thousand Five Hundred Pounds, yet, for the better furthering of the Service, we desire Ten Thousand Pounds, if it may stand with your Conveniency. "6. That their Pay, which we condescended unto from the 8th of December, be presently advanced to the 8th of February next, against which Time we are confident they shall be ready to march. "7. That a Man of War, or some Merchant Ship, be sent from Bristoll, West-Chester, or Dublin, to Locryan, for a safe Convoy and Guard of the Passage, because they, being in open Boats, may be subject to Inconveniencies from the Enemy, whose Frigates, we hear, are towards that Coast. "8. That the sending over these Men be without Prejudice to the Proceedings of the Treaty, which we desire may (fn. 3) go on without any Delay. Ordered, That this House agrees with the House of Commons unto these Propositions now presented from the Scotts Commissioners in every Particular; and that the Lords that go next to the King do acquaint His Majesty with them. That this House hath agreed with the House of Commons in all the aforesaid Propositions of the Scotts Commissioners. "That He doth well approve of the Desire of both Houses, for the speedy Proceeding against the Persons mentioned in the Petition, wherein His Majesty (finding the great Inconveniencies by the First Mistake in the Way) hath endured some Delay, that He might be informed in what Order to put the same; but, before that be agreed upon, His Majesty thinks it unusual and unfit to discover what Proof there is against them, and therefore holds it necessary (lest a new Mistake should breed more Delays, which His Majesty to His Power will avoid) that it be resolved, whether His Majesty be bound, in respect of Privilege, to proceed against them by Impeachment in Parliament, or whether He be at Liberty to prefer an Indictment at the Common Law in the usual Way, or have His Choice of either; whereupon His Majesty will give such speedy Direction for the Prosecution, as shall shew His Majesty's Desire to satisfy both Houses, and to put a Determination to this Business." And further his Lordship reported, "That the King hath granted a Warrant, for issuing out the Provisions and Ammunitions for Ulster." And his Lordship intimated from the King, "That the Stores grow very low, and are exhausted; therefore His Majesty desires the Parliament will take it (fn. 5) into Consideration how to supply the Stores of this Kingdom." Touching the Queen's Answer, his Lordship reported, That Her Majesty will send it either this Day or Tomorrow." To deliver a Copy of the King's Answer to the House of Commons. House of Commons have been informed, That the Lord Craven had said, That some of the House of Commons did tell him, that he that brought the Message last Night did mistake the Sense of the House, for the latter Part needed not to be annexed to our Thanks to His Majesty. "The Committee of the House of Commons did hereupon desire that the Lords Committees would enquire of the Lord Craven, who they were of the House of Commons that told him those Words. "That the Lords Committees had required the Lord Craven to reveal the Author that told him those Words, and his Lordship refused to do it; which the Lords Committees leave to the Consideration of this House." 2. Next his Lordship reported, "That the Lords Committees received Information, by the Examination of a Man of Sir John Pennington's, That the Lord George Digby is gone to Sea, for, upon Tuesday last, he did see the Ship (one of the King's Whelps) under Sail wherein he was, and, by the Wind and the Steering of the Ship, he went for Holland; and that the Horses which the Lord Digby did ride down upon he hath brought up. "3. A Message was brought from the Committee of the House of Commons, by Sir John Corbet: To desire the Lords Committees to take into their Consideration a Petition sent to them from the County of Salop, and desired it might be read; and further said, That the House of Commons had received divers Petitions, of the same Nature, from several Counties of this Kingdom; thereby they judge in what State the Kingdom would be in, if any Foreign Enemy should invade us: Therefore he was commanded to acquaint the Lords Committees, how much it concerns the Safety of the Kingdom to have the Militia of the Kingdom put into good Hands, and the Kingdom put into a Posture of Defence; and to desire the Lords would hasten their Answer concerning the Addition concerning the Militia, made the last Night to the Message which is to be presented to the King, as Thanks for His Gracious Message. "The humble Petition of the Subscribers, in Behalf of themselves and others, the Inhabitants of the County of Salop. 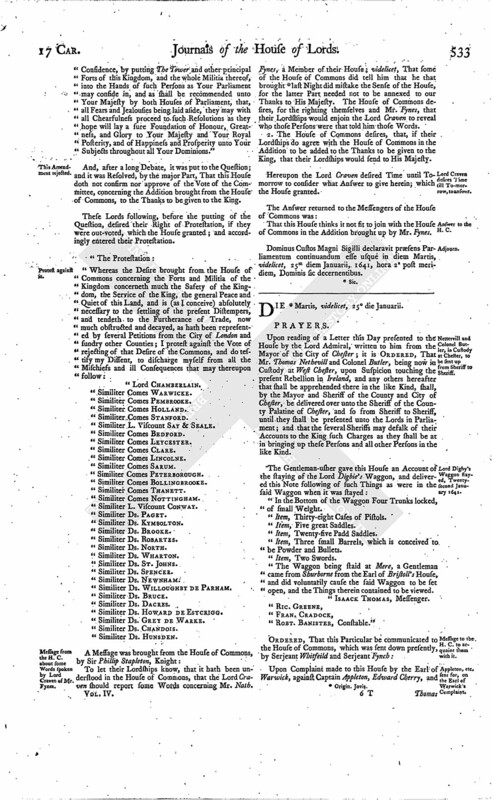 "Wherefore your Petitioners do humbly pray, in Behalf of themselves and the County, that some speedy Provision be made, whereby Monies may be warrantably cessed and levied, either for the raising of Forces for the suppressing of Insurrections, riotous Assemblies, and Rebellions that may arise, or for the Payment of Officers and Soldiers of the Trained Bands, and providing of Arms and Ammunition for the training and exercising of the same Soldiers by their Officers, in the Time of Peace, as also for Payment of the said Officers and Soldiers, if Occasion be to draw them into the Field; for the doing whereof, your Petitioners do humbly pray that it may be considered, whether Directions shall be attended from the Lord Lieutenant, or from whom, and also that it may be declared how far confining Counties may be aiding and assisting to one another, by leading their Forces into the same. 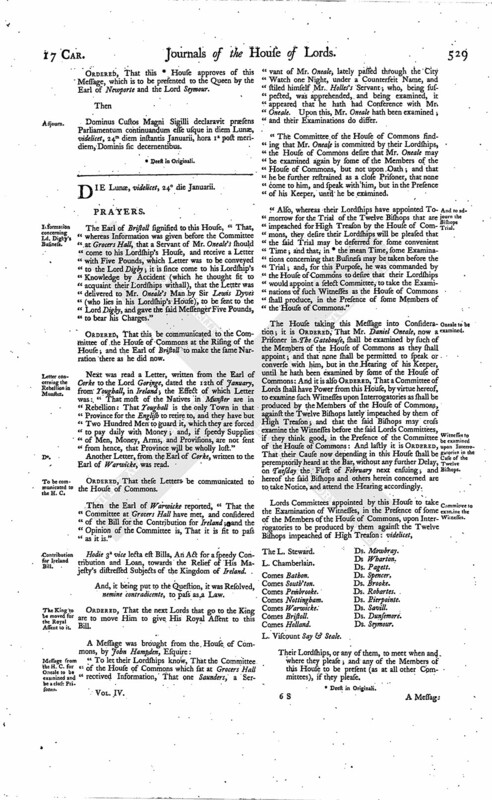 "And your Petitioners shall daily pray, &c.
His Lordship said, "That, upon this, the Lords Committees proceeded to the Consideration of the Addition brought up from the House of Commons last Night, which was to be annexed to the Thanks to be sent to the King for His Gracious Message; and it was Resolved, upon the Question, That the Lords Committees think it sit to join with the House of Commons, for the annexing this Addition to the Thanks which is to be given the King from both Houses." "1. To desire their Lordships would join with them, that (fn. 7) the King may be moved, to give Authority to raise Monies in Munster, for the War of Ireland. "2. To move the King, that a Commission may be given to the Lord Dungarvan, for to be Governor of Youghall. "3. That a short Day may be set for the Lord Lieutenant of Ireland, the Lord Viscount Conway, and other Officers, to go for Ireland; the House of Commons having set Tuesday next for such as are Members of that House, and Officers and Commanders in Ireland, to go. "4. To expedite the Propositions of the Scotts Commissioners. "1. That, if the Committee of the House of Commons will propound any legal Way for raising of Monies in Munster, the Lords Committees will be ready to join with them to move the King therein. "2. Concerning the Second Proposition; for the Commission for (fn. 8) the Troop of Horse, the Lord Dungarvon hath it already. For the Government of Youghall, the Lord Lieutenant had never any Order from the King to give any such Commission; but the Lords Committees think it fit the King be moved therein for his Lordship, by the Lord Lieutenant. "3. Touching the Third Proposition, That the Lord Lieutenant is ready at any Time to go into Ireland, when the Parliament shall command him; but the Lords Committees were of Opinion, that, until there be Forces there sufficient for him to take the Field, it may be dishonourable to the King and Kingdom for him to be there; but, so soon as there be convenient Forces there, he will be ready to go. "As for the Lord Viscount Conway, he is not now present; but the Lords Committees will send him Word to come To-morrow, and then he will give his own Answer. For the other Officers, their Lordships will appoint Thursday next to be the Day that they shall all be gone. "4. Concerning the Fourth Proposition, this Answer was returned: That their Lordships are ready to do it with all Speed." "The Letters were dated the 17th of January from Dubline, shewing, That the 18th of this Instant January, they were to begin the Provisions laid up in the Castle of Dublin, in case of Siege, which will be soon spent by the many Mouths that are to feed; therefore they desire that Provision may be sent with all Speed, in particular Butter, Cheese, and Provender for Horses. "By Letters likewise of the 17th of January from Dublin, it is advertised that Phelim O'Neale, with the greatest Power of the Rebels, was drawing towards Treda, which the Justices and Council of Ireland do conceive the Rebels could not have done if the Scotts had been landed in the North of Ireland; and therefore they desire that the Scotts passing into Ireland may be hastened, for the Defence of that Kingdom, and especially Dublin. "The Earl of Esmond's Letter and the Justices Letter were likewise communicated to the Committee of the House of Commons." "To the First Proposition, it was Resolved, upon the Question, That the Lords Committees do agree to the First Article with the House of Commons. "To the Second Proposition, the Lords Committees agreed with the House of Commons therein. 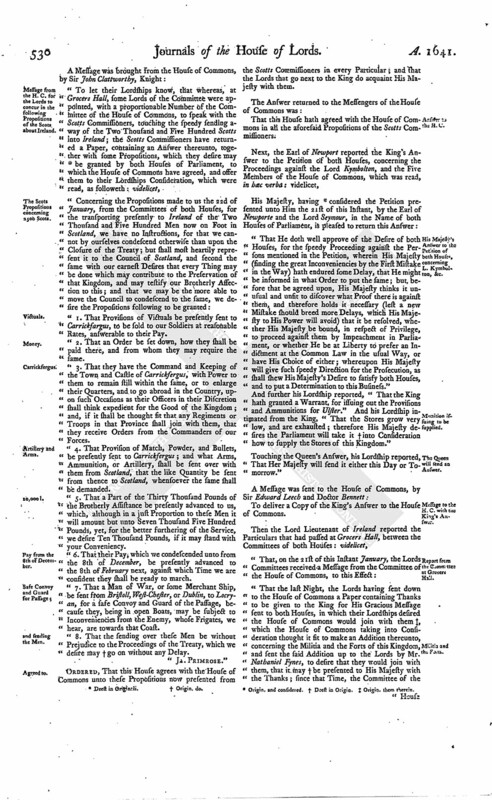 "To the Third Proposition, the Lords Committees agreed that an Explanation be made by the House of Commons, what they mean by the Word ["General"] in their Resolution to this Article; and likewise to propound unto the Committee of the House of Commons, That the Lords Committees think it fit, in regard they conceive there are no Horses to be had in Ulster, that the Scotts Commissioners be treated withall, to agree upon a Sum to furnish themselves with Horses for carrying of their Baggage, or else that the Horses might be raised for them here in England. "To the Fourth Proposition, it was Resolved, upon the Question, by the Lords Committees, To agree with the House of Commons in this Article. "1. Concerning such Towns and Places as shall be recovered from the Rebels by the Scotts Army, to be at the Disposing of the Scotts Commanders. "2. Concerning the General of the Scotts Army being commanded by the English Commander in Chief. "3. Concerning the Manner of their Marching, and the rest of that Article. "To the Sixth Article, the Lords Committees agree with the House of Commons. "To the Seventh Article, the Lords Committees agree with the House of Commons, that this Article be recommitted." "That the House of Commons did mean by the Word ["General"], in their Resolution to the Third Proposition ["he that commands in Chief in the Scotts Army"]. "For the raising of Horse in Ulster, the Committee of the House of Commons gave this Answer, That they do see more Difficulty now in raising Horses in Ulster than they did when that Vote was made, the Enemies having since much prevailed in that Province; therefore they did desire that it might be recommended to the English Commissioners, that they would propound it to the Scotts Commissioners, that they would proeither accept of a Sum of Money, and find themselves Horses, or else that the Horses might be raised for them here in this Kingdom. "Concerning the Fifth Article, the Committee of the House of Commons agreed, that the Account should be made to the Chief Governor of the Kingdom of Ireland for the Time being. "Also the Committee of the House of Commons do agree that the Three Propositions in this Article; videlicet, 1. Concerning the Towns to be taken by the Scotts from the Rebels, to be disposed of by their Commanders; 2. Concerning their General being under the Command of the English General; 3. Concerning the Manner of their Marching, and the rest of that Article; these Three to be new treated of. "At the same Free Conference, the Committee of the House of Commons propounded to the Lords Committees, That some Lords may be appointed to join with a proportionable Number of the House of Commons, and go this Night to the Scotts Commissioners, and to propose unto them, from the Committees of both Houses, That the Two Thousand Five Hundred Men, which are now paid in Scotland by the Parliament of England, may be presently sent to Carrickfergus. "These Lords returned with this Answer from the Scotts Commissioners, That there are but Two of them now together, and they could not treat without more of their Company; but they will look into their Instructions, and send the Lords Committees an Answer on Monday Morning, which should be satisfactory." "Whereas the Houses of Parliament have received from Your Majesty a Message, expressing much Grace and Favour to all Your Majesty's Subjects, they have thought fit to return to Your Majesty most humble Thanks for the same, and to let Your Majesty know, that they will take it into such speedy and serious Consideration as a Proposition of that great Importance doth require." 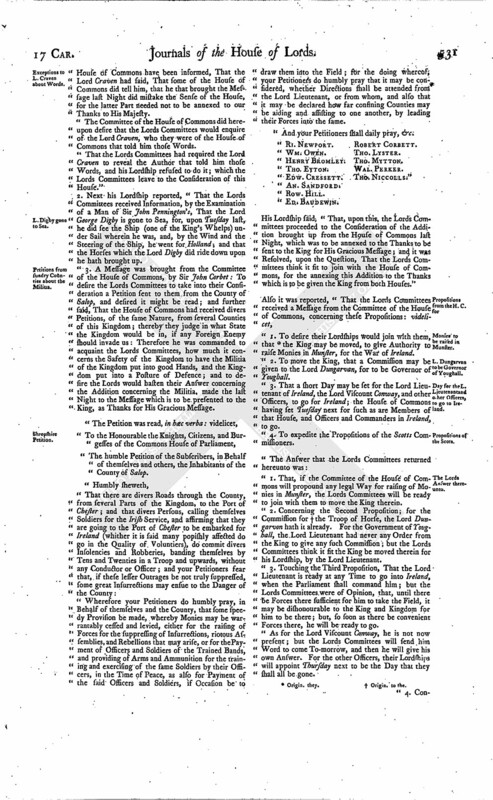 "And, to the further Intent that they may be enabled with Security to discharge their Duties herein, they humbly beseech Your Sacred Majesty to raise up unto them a sure Ground of Safety and Confidence, by putting The Tower and other principal Forts of this Kingdom, and the whole Militia thereof, into the Hands of such Persons as Your Parliament may confide in, and as shall be recommended unto Your Majesty by both Houses of Parliament, that, all Fears and Jealousies being laid aside, they may with all Chearfulness proceed to such Resolutions as they hope will lay a sure Foundation of Honour, Greatness, and Glory to Your Majesty and Your Royal Posterity, and of Happiness and Prosperity unto Your Subjects throughout all Your Dominions." And, after a long Debate, it was put to the Question; and it was Resolved, by the major Part, That this House doth not confirm nor approve of the Vote of the Committee, concerning the Addition brought from the House of Commons, to the Thanks to be given to the King. These Lords following, before the putting of the Question, desired their Right of Protestation, if they were out-voted, which the House granted; and accordingly entered their Protestation. "Similiter L. Viscount Say & Seale. "Similiter Ds. Willoughby de Parham. "Similiter Ds. Howard De Estcrigg. "Similiter Ds. Grey De Warke. To let their Lordships know, that it hath been understood in the House of Commons, that the Lord Craven should report some Words concerning Mr. Nath. Fynes, a Member of their House; videlicet, That some of the House of Commons did tell him that he that brought (fn. 11) last Night did mistake the Sense of the House, for the latter Part needed not to be annexed to our Thanks to His Majesty. The House of Commons desires, for the righting themselves and Mr. Fynes, that their Lordships would enjoin the Lord Craven to reveal who those Persons were that told him those Words. 2. The House of Commons desires, that, if their Lordships do agree with the House of Commons in the Addition to be added to the Thanks to be given to the King, that their Lordships would send to His Majesty. Hereupon the Lord Craven desired Time until Tomorrow to consider what Answer to give herein; which the House granted. That this House thinks it not fit to join with the House of Commons in the Addition brought up by Mr. Fynes. Dominus Custos Magni Sigilli declaravit præsens Parliamentum continuandum esse usque in diem Martis, videlicet, 25m diem Januarii, 1641, hora 2a post meridiem, Dominis sic decernentibus.